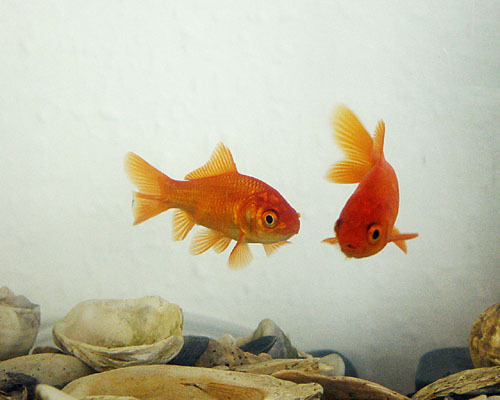 I own two goldfish. They are named George & Gracie after the whales in Star Trek IV. A few years ago, a rubber gasket on the aquarium's bubbler failed. In order to save my fish from asphyxiation, I fitted a toy water pump to an electric motor and placed the assembly above the aquarium. The motor draws power off of the house's 12-volt doorbell system. A Meccano throwbar connects a crank on the motor's shaft to the pump's handle. 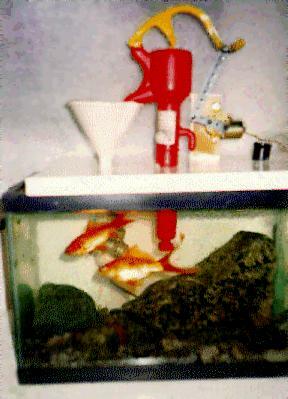 The pump lifts water up from the aquarium and dumps it into the top of a funnel. The funnel is filled with porous material which both filters the water and aerates it before returning it to the fish. An automatic timer shuts the pump off at night since it is fairly noisy. I am quite pleased with this system as it has worked reliably for years without any major failures. I did have to modify the pump's intake openings after I found that George (the stupid one) would occasionally get glued to the intake by the suction. It is also interesting to note that when someone rings the door bell, the power drain causes the pump to slow momentarily from its regular beat of one cycle per second. Update: After four years, George died. A few months later I was forced to give Gracie and the aquarium away when I moved from Canada to Scotland. I kept the pump. Update: I've got new fish! They live in the Digital Routes office (sort of like me). Although I was tempted to install the mechanical pump, the noise would have upset my coworkers. So I purchased a standard bubbler instead.